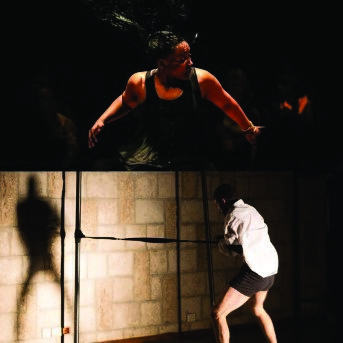 "Dance category award shortlisted 2017"
Due to some of the artists being refused visas to enter the UK, we have been forced to make some changes to the Arab Arts Focus Dance Double Bill. The double bill performance will be introduced by choreographer Shaymaa Soukry. The planned performance of Mayhkomsh will be replaced by another piece by Soukry, The Resilience of the Body, performed by Mahmoud El Haddad. The performance will be followed by a screening of an excerpt of Mayhkomsh. The second part of the double bill, Running Away by Yazan Iwidat, will be screened in full, not shown live. All tickets for this revised double bill will be sold at £8. This will continue until further notice; we hope that the dancer for Running Away may be able to join us later in the run, but this depends on a successful visa re-application. This solo was originally developed during a residency at the Cairo Contemporary Dance Center, it was originally performed by Shaymaa Shoukry, and has been reworked for Mahmoud el Haddad during a five day work process at Summerhall for the Arab Arts Focus showcase.